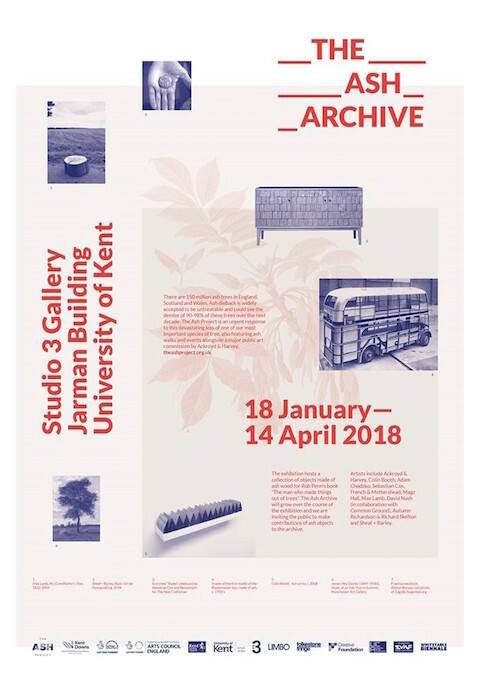 SMFA Fine Art Lecturer and acclaimed artist, Adam Chodzko, is featured in new exhibition, The Ash Archive, a collaboration between the University of Kent and The Ash Project which examines the human relationship with the ash tree and woodlands. Reflecting on the uncertain future of the ash tree, the exhibition brings together works by artists, designers and local makers which explore our dynamic and complex relationship with the life and death of the natural world. Artists featured include Ackroyd & Harvey, Colin Booth, ,Sebastian Cox, French & Mottershead, Magz Hall, Max Lamb, David Nash (in collaboration with Common Ground), Autumn Richardson & Richard Skelton and Sheaf + Barley, and there is a collection of objects made from ash wood from Rob Penn’s book The man who made things out of trees. The Private View is on Thursday 18 January, 6-9pm, at Studio 3 Gallery, Jarman Building, School of Arts, Canterbury. The exhibition runs until 14 April. The exhibition is curated by Madeleine Hodge and Rose Thompson for The Ash Project in partnership with the University of Kent, and will tour galleries across Kent in 2018, including Limbo Gallery in Margate, Nucleus Arts in Chatham, UCA Brewery Tap in Folkestone as part of the Salt Festival and at Kaleidoscope Gallery in Sevenoaks. WICKED – Women in creative event design. Event & Experience Design Showcase.